Austenitic (B2) NiTi samples were cathodically charged with various amounts of hydrogen. Trends are tracked based on temperature, time and voltage throughout the process to establish consistent and predictive hydrogen charging procedures. The effect of hydrogen on the austenitic structure and the formation of hydrides are studied with x-ray diffraction (XRD). An increase in the austenite lattice parameter with increased hydrogen content is observed up to a hydrogen solubility limit of approximately 85 wppm. At greater hydrogen concentrations, additional XRD peaks appear, suggesting possible hydride formation. Differential scanning calorimetry (DSC) results show a decrease in both the austenitic and martensitic transition temperatures with increased atomic hydrogen content and increased hydride phase. Scanning electron microscopy (SEM) is used to reveal the hydride phase. 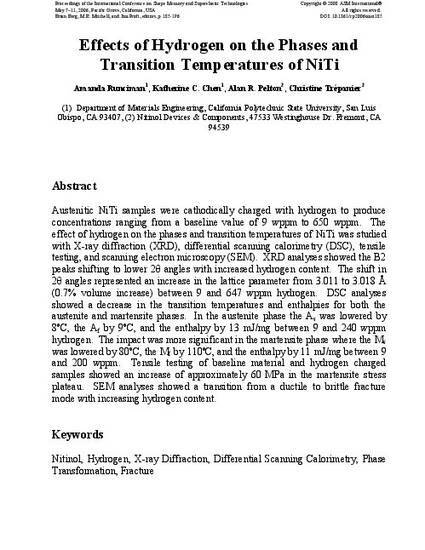 The effect of atomic hydrogen on NiTi and the structure of the hydride phase are compared with previous hydrogen studies. 2008 American Society for Microbiology.